Let us make your cookies! 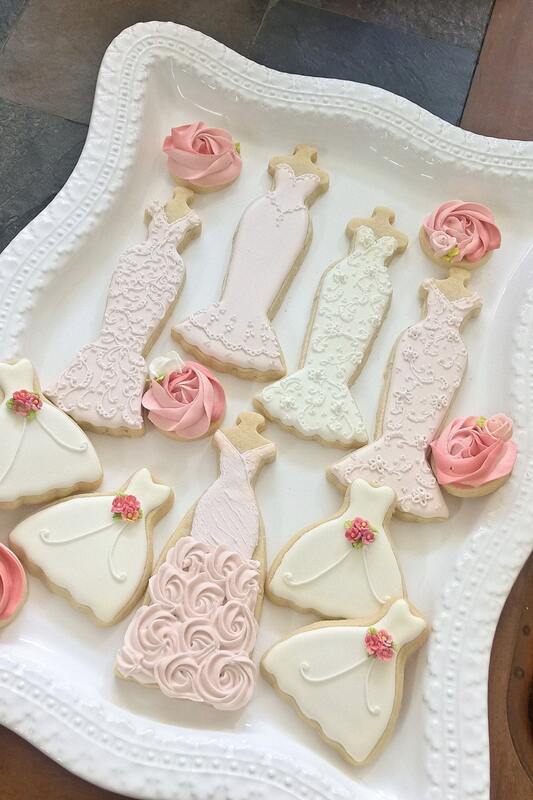 Edible wedding favors-Pink and White Wedding Entourage Dress Cookies-Bridal Shower Cookies, Bridesmaids Gifts, Spring Wedding Cookie Favor. 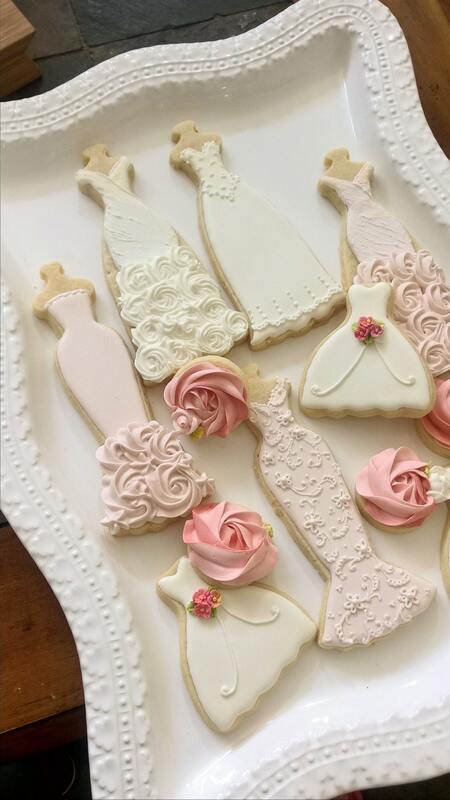 This listing is for 10 pieces of assorted wedding entourage gown cookies iced and decorated to match your actual gowns. Each cookie is approximately 2.25x 6.25 inches in size. They are iced with royal icing and finished with shimmery white satin confectionery luster dust. 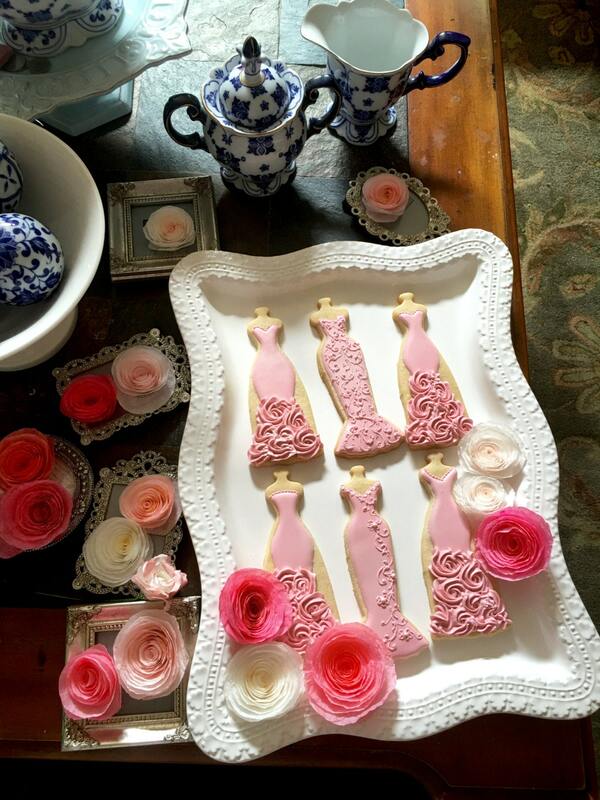 These cookies can be daintily detailed to resemble classic lace bridal gowns. 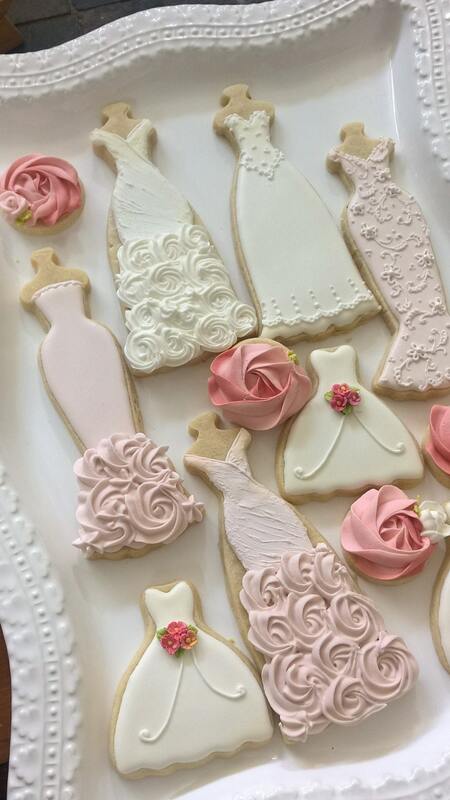 **The petite gown cookies can be bought separately for $3.25 each. Size is approximately 3.5 x 3.5 inches. 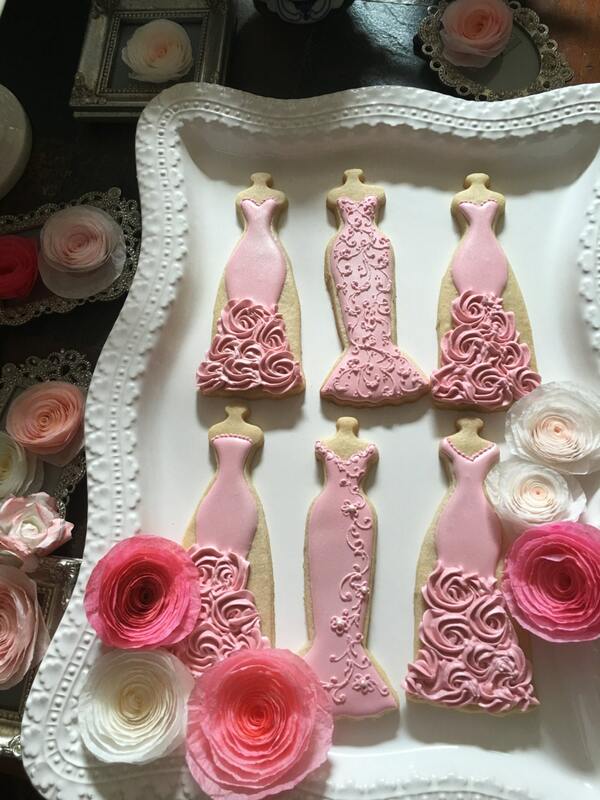 ***The Rosette cookies are good for accent pieces if you want to set the gowns in a platter. They are available separately at $30.00 for a dozen. Approximately 2 inches in size, rosette frosting is royal icing. They will be individually wrapped in self adhesive resealable cellophane. Since these cookies are handmade individually, please note that there will be some slight variations in color and size. Prepared and processed in a kitchen where allergens such as dairy, almonds, and other nuts or nut bi-products are used. If this posts any kind of harm, please do not purchase. Cookies are made to order and are therefore non-cancelable. Shipping may take 2-3 days via USPS Priority Mail. Thank your for looking and I hope we'll be starting a project together soon!! Not only were they beautiful, they were delicious. They arrived on time and securely packaged. Out of 30 only 1 was broken. Very satisfied with my purchase. These are stunning! The detail is crazy! Not a broken one in the bunch. They package very well. They were the hit of my daughters shower. I had a few left over and oh my gosh I wish they were all gone. They are so yummy that I felt obligated to not let them go to waste as they are about $5 a piece. I proceeded to eat them. Yup 5 cookies in 24 hours. This is not my proudest moment but I couldn't help myself. There is something really addicting about the cookie part. They taste amazing! Well worth the cost! Thank you so much for the cookies, not the extra pounds! Cookies arrived on time. Are so beautiful and everyone loved them. Only one was broken but we had plenty so all was fine. Will definitely recommend. I now accept Etsy gift cards, major credit cards, and Paypal. I take great care in packaging my products. The individually wrapped cookies will be placed in a bakery box, very well padded with bubble wraps and paper shreds to ensure that they are not moving around inside the box. The bakery box is then placed in a sturdy shipping box, again padded for more protection. Design changes are allowed as long as I have not started processing the order. Please know that the cookies are processed in a kitchen where known allergens are present. These include nut products and bi-products, dairy, and most known vegetable allergens. If this posts any harm, please do not purchase. Thank you!